First thing that came to my mind after work was to head to big Giant to get eggs, fruits, etc. I chose to park at the open car park and voila! There's this flea market-like place with baju and food stalls, obviously stuff from Thailand. 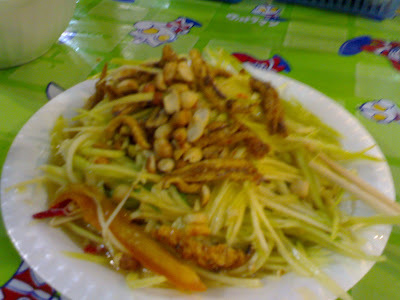 Huge portion of mango, tomato, and long bean slices topped with ikan bilis and peanuts. Don't ask for chillies. I've no idea what kind they use. Two of them in this dish set my tongue ablazed for a long time and I tried my best to finish the whole plate. This kerabu has coarsely chopped garlic as well. Overall, it's delicious and healthy, minus the fact that my tongue was swollen and my face was as red as the chillies, I think. Lol! Not bad. Just don't comment about the price first. 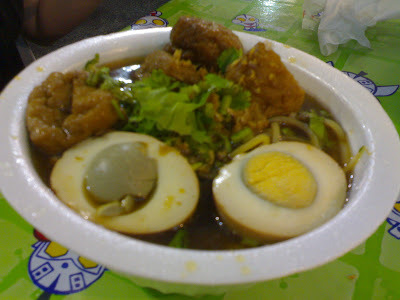 This hearty little bowl was packed with taupok, an egg, chicken, noodles, and a handful of coriander leaves on top. The soup tasted like Chinese herbs but overall, nice! The stalls are opened till early next month (October) but I'm not sure whether they are open for business during daytime. If you happen to drop by big Giant after working hours, you might want to check them out.